Management by committee is the organizational response to the individual’s fear of making decisions because he or she might make a “mistake” and incur blame, or worse, a superior’s wrath! It very much is human nature to avoid being “blamed” for decisions or actions, and to the extent that such “blame” can be “spread around” to others, the less that will be attributed to any one individual. Herein lies the crux of the management by committee culture. Why is the “management by committee” approach so intrinsically awful? Let’s look at how the typical committee approaches its duties and responsibilities. Formation of the committee. Normally, the first member of the committee to be selected is the “chair,” the person who will preside over the committee. The chair usually then selects the other committee members. Who generally is selected? Friends or coworkers of the chair and probably the appropriate “experts” at or just below the level of management enjoyed by the chair. This mix of people may prove to be a good one, but the essentially subjective, willy-nilly criteria on which most were selected for committee membership probably won’t produce this result. Setting the agenda. This process can literally go on for weeks and sometimes even months because of the inherent nature of a committee to require consensus on all “key” matters under consideration. Assigning ‘sub’ committees. Show us a committee and soon we’ll show you a proliferation of “sub” committees, made up of committee members who may or may not even be qualified to intelligently investigate the particular problem or subject area assigned to them! Meetings, meetings, meetings. 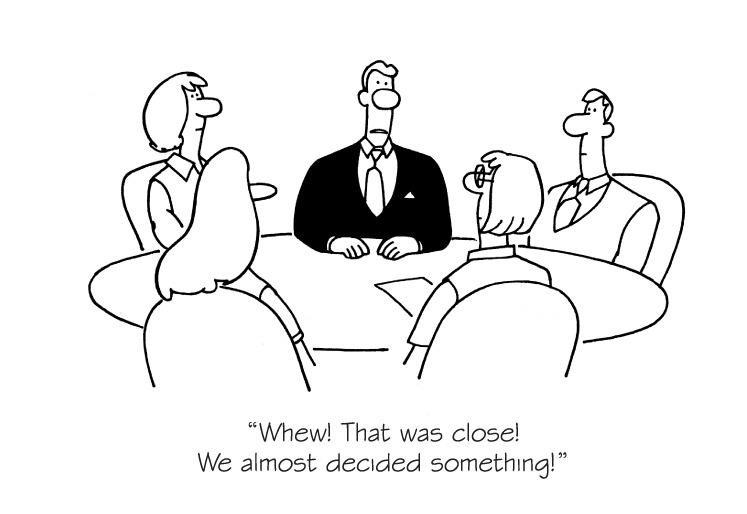 If it’s one thing committees love even more than building a consensus it’s having meetings. 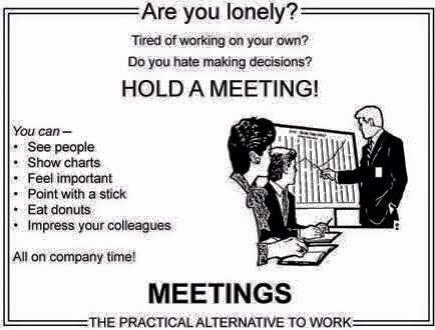 The more meetings, the better, because lots of meetings mean the time when a decision (or recommendation) will actually have to be made gets farther and farther down the road. From our way of thinking, it would be difficult indeed to come up with a more inefficient, more expensive way of managing a business enterprise, any business enterprise. Yet the “management by committee” syndrome shows no signs of abating anytime soon. The reason for this, we believe, is simply because so many businesses today have already progressed to the latter stages of the Company Life Cycle, i.e., the “aging athlete” (a company merely “running in place”) or the “old geezer” (a company literally on its last legs). If your company is vital and prosperous, you’re probably not with a company that manages by committee. Instead, you’re quite likely with a company that is still in the vibrant early stages of the company life cycle. Count your blessings! If, however, it is your misfortune to be with a company that does manage by committee, your company probably is headed for the “final round-up,” and quite likely so are you, as long as you stay with that company.